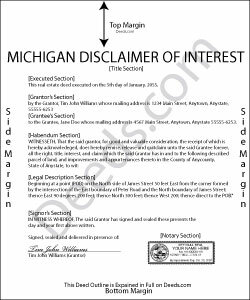 A beneficiary of an interest in property in Michigan can disclaim and renounce all or part of a bequeathed interest in, or power over, that property under MCL 700.2902, as long as it has not been accepted through actions that indicate ownership or through a written waiver of the right to disclaim (MCL 700.2910). The written disclaimer must identify the creator of the interest, provide a description of the disclaimed interest, a declaration of the disclaimer and its extent, and it must be signed by the disclaiming party (MCL 700.2903). A disclaimer must be delivered in order to be valid, which can be done by mail or in person (MCL700.2906(1)). There is no time limit on this delivery in Michigan statutes, but federal guidelines require that it be received by the transferor, the legal representative, the trustee(s), or the current holder of title within nine months of the transfer (usually the death of the creator). The disclaimer may also be filed with the probate court that would or is going to handle the estate. In the case of real property, it can be recorded with the register of deeds in the county where the property is located (MCL 700.2906(3)). A disclaimer functions as a non-acceptance rather than as transfer of the interest; it is irrevocable and binding for the disclaimant and those claiming under him or her (MCL 700.2909), so be sure to consult an attorney when in doubt about the drawbacks and benefits of disclaiming inherited property. Kristy T. said: Using your site made gifting personal property (land) so quick and easy. The forms were presented ready to complete and included detailed instructions. The "completed form" example was helpful. I definitely recommend your site to anyone who does not wish to pay expensive lawyer fees.